Market analysis courtesy of Tea Lane Associates, with offices in West Tisbury and Chilmark. For more information, call 508-696-9999 or visit tealaneassociates.com. 2016 proved to be a very active year for the Island real estate market, with more transactions than any year since 2000. Performance was strong in all segments of the market except for the very high end, where there were no sales over $10 million. This was in contrast to 2015, which saw a record-breaking seven sales over $10 million, including three sales over $20 million. Did 2016 sustain the growth of the real estate market surge in 2015? For the most part, yes, although the results were mixed. Compared with 2015, the number of properties sold in 2016 increased 4 percent to 624, total dollar volume decreased 6 percent to $636 million, and the average sales price decreased 9 percent to $1,019,800. The declines in dollar volume and average price were due to the absence of sales over $10 million. Acknowledging that the high-end market over $10 million suffered in 2016, and looking at the yearly numbers excluding sales over $10 million, a different picture of the market emerges. Without the $10 million-plus transactions, the number of properties sold in 2016 increased 5 percent compared with 2015, total dollar volume increased 14 percent, and the average sales price increased 8.5 percent. This is an impressive performance for the majority of the market in 2016. Last year we noted that for the first time in 10 years, the peak inventory level in 2015 was lower than the number of properties sold that year. This trend continued in 2016, with the peak inventory level dropping farther, to 372, while the number of transactions rose to 624 (up from 602). This fact, combined with the resulting climb in average price, suggests we are firmly stepping into a seller’s market (under $10 million values). Unless inventory is replenished, there may be pressure on prices to rise further. While the above statistics include all transactions and represent Island-wide performance, individual towns and market segments reveal different dynamics in 2016. 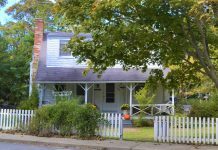 Martha’s Vineyard is an island with six towns, each with its own character and specific market conditions. Within each town there are different niches as well: waterfront, water-view, high-end, midrange, entry-level and commercial properties. Because each of these market segments can be, on its own, very small, generalizing trends or making broad statements is difficult. Still, it’s fair to say that Chilmark was the leader in both the high-end market and in overall growth in 2016, while Edgartown was the leader in 2015. The Chilmark market surged in 2016, with a 49 percent increase in the number of transactions (from 37 in 2015 to 55 in 2016). Total dollar volume rose 71 percent to $11 million (from $68 million in 2015), and average price climbed 15 percent to $2.1 million (from $1.8 million in 2015). High-end transactions over $3 million doubled from seven transactions in 2015 to 14 in 2016. Drilling down further into these high-end sales, there were nine sales over $5 million in 2016, compared with only three in 2015. Although Chilmark’s surge was driven by the high-end segment over $3 million, all segments in Chilmark grew in 2016. There were 23 sales under $1 million in 2016, up from 17 in 2015, and 18 sales between $1 and 3 million in 2016, versus only 13 in 2015. Of the 10 highest sales on Martha’s Vineyard in 2016, seven of these sales were in Chilmark (plus one in West Tisbury, one in Tisbury, and one in Edgartown). Chilmark is a small market of high-end properties, where a few sales can make an impact. In 2016, pond-front properties took the spotlight, and filled the top two slots for the year in Chilmark at $7.6 million and $7.65 million (these were also the second and third highest sales Island-wide). The $7.6 million transaction was the sale of a rare 9.2-acre property with deep water dock and beach on Menemsha Pond. The house and guest cottage have exceptional panoramic views and an 11-bedroom septic system installed for future expansion/renovation of the structures. The $7.65 million transaction was the sale of an 8.3-acre property on the Tisbury Great Pond with a beautiful 5,700-square-foot, six-bedroom main house plus one-bedroom guesthouse. Pond-front properties outperformed oceanfront properties in Chilmark in 2016 with their beautiful views, interesting topography, and endless water activities, but there was a Chilmark oceanfront sale for $7,350,000 as well. West Tisbury also had a strong year, with a 22 percent increase in the number of transactions from 58 in 2015 to 71 in 2016. Total dollar volume rose 32 percent to $73 million (from $55 million in 2015), and average price increased 8 percent to $1.022 million (from $948,000 in 2015). The middle market ($1 to $3 million) remained flat in 2016, but both the high end (over $3 million) and lower end (under $1 million) experienced growth. There were five sales over $3 million in 2016, versus one in 2015. Sales under $1 million continued to expand from 46 sales under $1 million in 2015, compared with 55 in 2016. Aquinnah had a solid performance in 2016 with a 33 percent increase in the number of transactions (from 12 in 2015 to 16 in 2016), but since 2016 lacked the high-end sales of 2015, the total dollar volume fell 15 percent to $15.4 million (from $18.2 million in 2015), and average price decreased 36 percent, to $963,000 (from $1.5 million in 2015). Note that 2015 saw the record-breaking highest price sale in Aquinnah at $6.5 million, plus two other sales over $2 million, whereas the highest sale in 2016 was $1.95 million. The lack of high-end sales affects total market volume and average price negatively, but there was impressive overall activity in this market in 2016. The growth segment for Aquinnah in 2016 was the $1 to $2 million range, which had 10 transactions in 2016, versus only three in 2015. On balance, it was a healthy year for the smallest town on the Island. The three down-Island towns of Edgartown, Vineyard Haven, and Oak Bluffs experienced mixed results in 2016. Edgartown performed modestly in 2016. The gains of 2015 proved to be an anomaly, and were unsustainable in 2016. The number of transactions fell 22 percent to 182 (from 233 in 2015), total dollar volume decreased 38 percent to $222 million (from $356 million in 2015), and average price slid 20 percent to $1.22 million (from $1.53 million in 2015). The 2016 decline may seem dramatic, but it is important to note that 2015 was a record-breaking year for the town in all sectors, and included five of the seven sales on the Island over $10 million (three of which were over $20 million), including the record-setting highest priced sale of a private residence on Martha’s Vineyard, at $24.75 million. The 2015 results proved impossible to match, and 2016 returned to normal levels of activity for Edgartown — stronger than its 2014 performance and almost identical to its 2013 numbers. Edgartown is the largest market on the Island, with more transactions and dollar volume that any other town. Edgartown also has the most expansive price range of all the towns, from some of the Island’s lowest-priced properties to the Island’s most expensive properties. Edgartown’s lower-end market under $1 million saw 109 sales in 2016, down 27 percent from 149 sales in 2015. The midrange segment of $1 to 3 million saw 55 sales in 2016, versus 63 sales in 2015 (a 13 percent drop). And looking at high-end sales over $3 million, there were 17 transactions in 2016, compared with 21 in 2015 (a decrease of 20 percent). Digging deeper into the high-end sales, there were only two sales over $5 million in 2016, compared with eight in 2015, and Edgartown had only one sale in the top 10 Island-wide for 2016. Overall, the entire range of Edgartown properties experienced less activity in 2016 compared with its boom year of 2015. 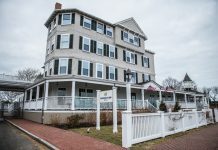 Vineyard Haven posted a 16 percent increase in the number of transactions to 140 (from 121 in 2015), and an increase in dollar volume of 9 percent, to $104 million (from $96 million in 2015). The majority of this growth occurred in the under-$1 million market, which drove down average price by 6 percent to $746,000 (from $790,000 in 2015). For the second year in a row, the increase in transactions was concentrated on the lower end of the market, under $1million, where there were 118 sales in 2016, versus 102 sales in 2015. Mid-market sales from $1 to $3 million grew slightly, from 16 sales in 2015 to 19 in 2016, and the high end over $3 million remained flat, at three sales in both 2015 and 2016. Oak Bluffs bounced back from its slowdown in 2015 and experienced solid growth for 2016. The number of transactions in Oak Bluffs rose 13 percent to 160 (from 141 in 2015), total dollar volume grew 28 percent to $106 million (from $83 million in 2015), and the average price increased 13 percent to $662,000 (from $588,000 in 2015). The mid-market in Oak Bluffs performed impressively for the second year in a row, with sales in the $1 to $3 million range climbing from 13 in 2015 to 20 in 2016. Sales under $1 million continued to grow as well, from 126 in 2015 to 138 in 2016. The market under $1 million continued to thrive in 2016, with more sales under $1 million than in any year since 2004. However, the number of transactions in this segment grew by only three transactions this year, from 446 sales under $1 million in 2015 to 449 sales in 2016. This flattening may signal a slowdown in this segment, with rising prices responsible for taking some properties over the $1 million mark. Foreclosures had only a minimal impact on the entry-level market in 2016. From 2008 through 2012, foreclosures had a major impact on the number of sales under $1 million, but fortunately the number of foreclosures dropped off dramatically in 2013. They continued to fall each year until 2016, which saw a slight rise in foreclosures, from 15 in 2015 to 18 in 2016. However, this is well below the foreclosure levels of ’08-’12, and therefore, like all the years since 2013, it was natural market forces, not foreclosure sale pricing, that made an easier entry into the market in 2016. Although sales over $10 million did not come into play in 2016, the high end did not suffer. The high-end segment of the market over $3 million continued to strengthen, with more sales than in any year since we started tracking this data in 2003. There were 41 sales over $3 million in 2016 on the Island, compared with 36 sales in 2015. The peak years of 2006 and 2007 saw 34 and 33 sales in this segment respectively, but since then, the market dropped to 15 as the low in 2011. The sale of commercial properties grew to 20 in 2016 (up from 16 transactions in 2015). 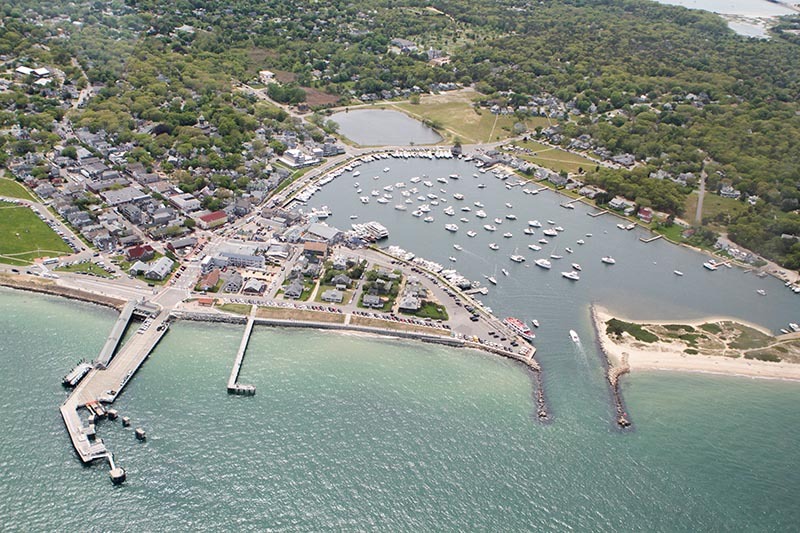 The largest commercial real estate transaction in 2016 was the sale of 80 and 100 Lagoon Pond Road in Vineyard Haven, which consists of three commercial parcels totaling 2.4 acres with warehouses, marina, and a residence for $4.6 million. Looking back to 2012-2014, we saw the real estate market on Martha’s Vineyard stabilize from the recession of the preceding years. This was followed by an exceptional uptick in 2015, with a record-breaking number of sales over $10 million. 2016 brought about a more moderate level of growth and a solid performance for most of the market on the Island. Chilmark, in particular, saw a surge in overall market growth and strong high-end activity. The two exceptions to this healthy growth in 2016 were 1) the ultra-high-end over $10 million, which disappeared in 2016, and 2) the Edgartown market, where the performance of 2015 was just too aggressive to match. Overall, the Island real estate market was more active than ever, and significantly outperformed the years preceding 2015. It’s worth noting that a year of reduced (or increased) activity in a specific town or market niche ($10 million-plus) is not the same as an overall trend. There is a cyclical rhythm to sales activity on the Island. Buyers often look for several years before finding the right property, and in a market where just a few sales can make a difference, this rhythm is reflected in the statistics. There can be a backlog of active buyers (or a surplus in inventory) causing an increase in transactions one year and, once they buy, a decrease the next. The cyclical nature of our second-home market may explain the disappearance of the ultra-high-end over $10 million, as well as the more modest activity in Edgartown in 2016 after the surge in 2015. What 2017 brings remains to be seen. As a vacation home market, the Island’s real estate sector reacts differently to national and global forces than a primary home market, but we are not immune to the effects of world events on our local economy, for good or bad. The health of the national economy will impact us, as will interest rates, which are predicted to slowly rise. There is profound uncertainty brought about by the unfolding change in political power in our country, and we cannot predict what will happen in the year to come. 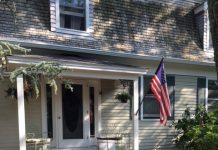 But we know the historical strength of the Martha’s Vineyard real estate market, and after seeing a second consecutive year of gains, rooted in a foundation of three previous years of stability, it seems a strong possibility that the Island real estate market will continue on this trajectory of healthy growth for 2017. The first half of 2017 was a strong start to the year, with a 33 percent increase in total dollar volume (from $229 million in the first half of ’16 to $305 million in the first half of ’17), and a 13 percent increase in the number of transactions (from 248 in the first half of ’16 to 280 in the first half of ’17). The high-end over $10 million has returned in 2017. After no sales in this range last year, there were two sales over $10 million in 2017 so far: a $20.5 million property on Edgartown Harbor and a sale in Chilmark of $11.75 million for a waterfront property on Vineyard Sound. Most of the gain in the first half of 2017 was due to Edgartown’s performance. Edgartown’s dollar volume increased 97 percent, from $68.4 million in the first half of 2016 to $134.9 million in the first half of 2017. Edgartown doubled its sales over $2 million during the first half, from seven in 2016 to 14 in 2017, including the $20.5 million property mentioned above, which was the highest-priced sale of the year so far. Chilmark transactions were flat, from 22 in first half 2016 to 21 in 2017, but Chilmark’s dollar volume was off 30 percent (down from $45.5 million in first half 2016 to $32 million in first half 2017). It is worth noting that 2016 was a strong year for Chilmark and a weak year for Edgartown. Edgartown has been able to rebound in 2017, and Chilmark has kept pace with the level of transactions, but has some work to do in the second half to keep pace with dollar volume. As inventory levels decrease further, putting pressure on prices, the shift toward a seller’s market continues. The lowest inventory of the year typically occurs in March, and the low in 2016 was 268 properties, while 2017 bottomed out at 229.